Run, Hide, Fight: is your Kid's University Campus Unprepared for a Campus Shooter? In early December 2018, there was strange confusion in social media, and in particular many conservative media outlets, about "hockey pucks" being given to students and faculty at a "Michigan" university to "throw at shooters". Descriptions suggested images of students and faculty roaming the hallways like Marines, to attack bad guys with hockey pucks. The shocking secret of the whole affair was the number printed on these pucks, which almost no Fox media outlet ever actually explained, even though some were using a picture of the special puck they found in one of my own twitter posts. 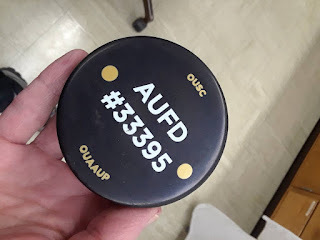 Printed in bold large font, it says "#33395 AUFD". What does this educational tool refer too? Autism. What are the causes? The genetic realities we are learning about today. For decades, many parents with autistic children have wanted to know why their child has autism and they wanted some thing to blame for the condition. This has lead to vaccines being blamed, which many studies have shown is not true, and even other drugs such as antibiotics. I previously wrote a blog post on this topic, describing the some of the first new findings of genetic reasons, DNA changes, that impact genes encoding for proteins that are important to the normal function of neurons (neural cells) in our brains. This has come about largely because of our ability to now completely read the entire genomic DNA sequence of a patient. Children with autism, and also the genomic DNA sequences of their parents.